This November was my first year participating in National Novel Writing Month. People always talk about the community NaNoWriMo creates, and I believe it is a huge reason this program works. The forums are so helpful, and I found myself spending hours reading about people’s questions and answers and creations and stories. I loved getting to know other NanoWriMo-ers, and it helped to see that other people had the same struggles as me. NaNoWriMo has been my first group-ish writing experience since I graduated from college. I am so thankful that people are creating places for writers to find each other and share stories. I have missed it more than I realized, and I will be participating in NaNoWriMo every year, and I hope to have a more successful year in 2015. But what meant the most to me was what the experience revealed about myself as a writer. Here are just a few of the things I learned and obstacles I faced throughout NaNoWriMo. Sometimes you don’t get your ideal writing environment. Before NaNoWriMo, I somehow convinced myself that the only time I could write something halfway decent was in the morning after breakfast and drinking my first cup of coffee for the day. I thought if I wrote outside that time, it would be crappy and awful and worthless. But that isn’t true. I found myself writing after dinner, at midnight, during breaks at work. You have to write when you can. Even more than this, sometimes you have a cat knock a glass off your desk. You have to stop mid sentence and grab a rag to clean it up, and when you get back to your desk the words are gone. Sometimes a child will run into your room and tell you they’re hungry, or bored, or sad and you must stop to help them. Sometimes your doorbell rings, or your laundry is done, or you have to pee. Life is full of interruptions, and it will be a rare day when you can write without stopping. There are days when you have no motivation at all. There are days when you stare at your computer, fingers floating over the keyboard, waiting for the first bout of inspiration to carry you through your 1,600 words for the day. And sometimes it never comes, and you drag yourself to bed, or to work, or to chores with a heavy heart. NaNoWriMo gave me an understanding that everyone has that experience, even J.K. Rowling and Oscar Wilde (though he would never admit it), and everyone has to fight through it. And all you need is a small spark. This spark can be found in yourself, in others, in an event, or a word. It can be found anywhere, but you have to be looking. Sometimes you think you’re a pantser when YOU ARE NOT. I thought I had figured myself out as a writer in college (BA-HA-HA, I know I’m naive). I thought I needed a bit of an outline to get me going, and then the words would just come to me. That’s how it usually worked with short stories, at least. But novel writing is a completely different thing. I had outlined my novel a lot, but as soon as I got to the point where my outline ran out, I was stuck. I had nothing to write about, and my characters were running around with no goal or point. NaNoWriMo taught me I’m a planner. And thank goodness I know that now and can write novels the right way for me. 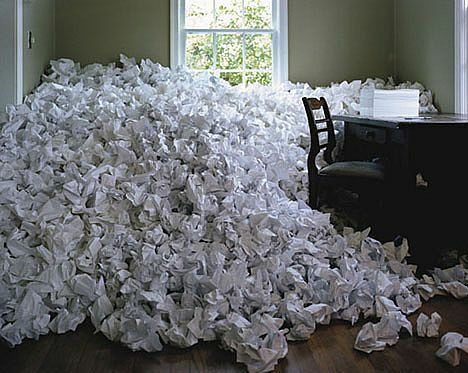 Sometimes it is extremely hard to write in a room full of non writers. Not the most motivating thing in the world, bless their hearts. I know they were trying to make me feel like I had done enough, BUT IT WASN’T ENOUGH. You must write wonderful new words every day, or else you feel like you can skip a day every now and then and you CAN’T. Every day, write. this experience reminded me that writing is HARD. And any day you sit down in front of a computer and melt words together to create something beautiful is a damn awesome day. I didn’t win. I didn’t even make it halfway to 50,000 words. But I wrote everyday. I watched my characters grow and change and love and lose. And I remembered why I became a writer in the first place.